yourFXguide-What's up traders, I always try to develop my own strategies to ensure profitable trading, and share those on yourFXguide so that we can together be good traders. In my previous post, I explained one of the ways to predict the Elliott's impulsive five waves with fibonacci retracement levels. Today I am going to explain a different way to predict the Elliott's impulsive five waves with fibonacci retracement levels. A common question asked by the traders is "Why do we need more than one way to predict the Elliott's impulsive five waves?". We need more than one ways to predict impulsive five waves because all ways may not be effective in all cases. Along the post the principle I will explain is " When the top of the third wave is at the 1.618% fibonacci retracement of second wave, little upper or lower, the top of the fifth wave may lie on the 2.618% fibonacci retracement level of second wave and/or 1.618% or 2.618% fibonacci retracement level of fourth wave." The above image illustrates this principle graphically. 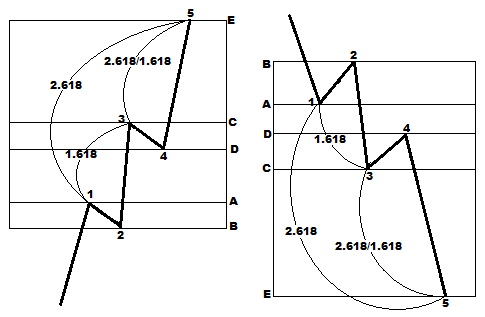 Fibonacci ratios and fibonacci retracement levels are almost similar. Now I am going to see whether the Elliott's impulsive five waves can be predicted with this principle or not. 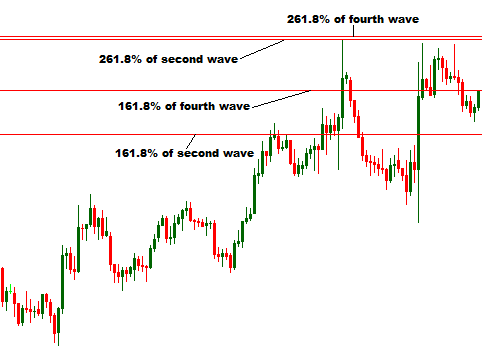 In the above illustration, fibonacci retracement tool is drawn from beginning to end of second wave, we can see the top of the third wave is little upper than the 161.8% fibonacci retracement level of second wave. According to the principle, this is expected that the end of fifth wave will be at the 261.8% fibonacci retracement of second wave, and we can see that the top of the fifth wave exactly at the 261.8% fibonacci retracement level of second wave. In real time market, when we find the top of third wave the fourth and fifth wave are completely unknown to us. So, we will just put a horizontal straight line at the 261.8% fibonacci retracement level, and will wait for the fourth wave. 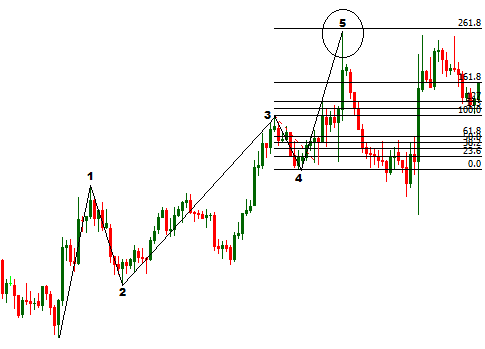 When the fourth wave is formed, we will draw a fibonacci retracement tool from beginning to end of fourth wave. According to the above principle, the end of fifth wave should be at the 161.8% or 261.8% fibonacci retracement level of fourth wave. In some web trading platform the fibonacci retracement tool may not be available. 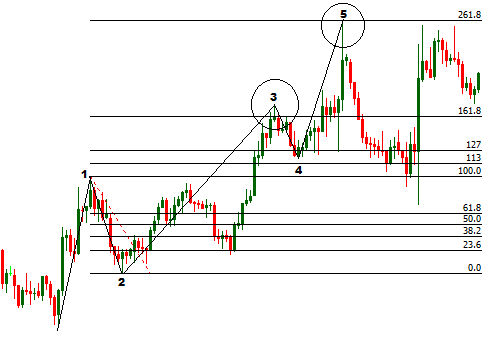 But the traders trading on web trading platform can apply the following formulas to find the fibonacci retracement levels, and can predict the impulsive five waves. 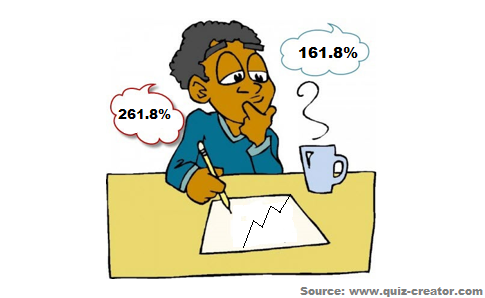 To understand the formulas you should have a look at the second illustration in the post. The price levels found from the formulas can be written down on a piece of paper or can be marked with horizontal straight lines as done on the image below. Dear Traders, from the above discussion, we can say that the aforementioned principle can be applied to predict the Elliott's impulsive five waves. If you have any question regarding this post, you can drop it into the comment section below. You can also subscribe yourFXguide to receive updates right into your inbox. Simply, enter your email address into the email subscription box and click subscribe, then sign into your inbox and click the confirmation link. Thank you !! !